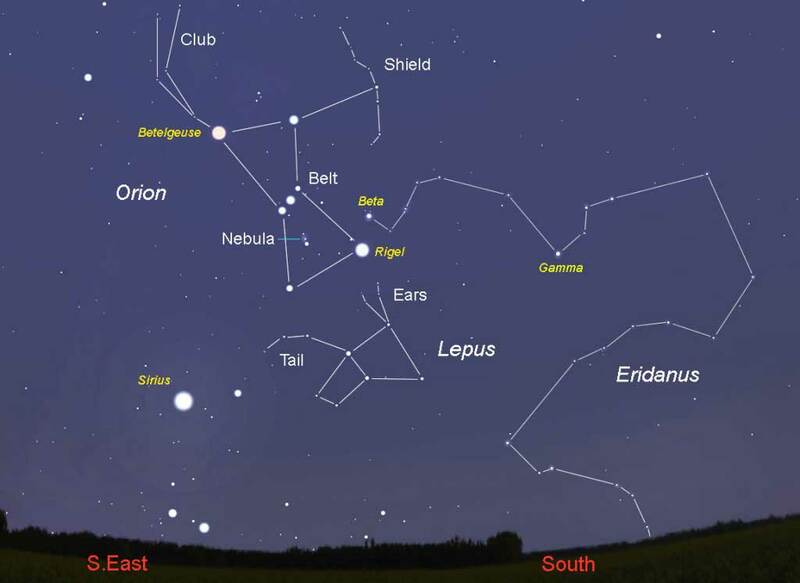 Lepus, the Rabbit, is chased across the February evening skies by the great hunter, Orion. The Greeks who named this constellation, envisioned the hare forever eluding Orion’s hunting dog, Canis Major, as the groups makes it way toward the river Eridanus to the west. The brightest star in Lepus is Arneb, Alpha Leporis. It is a second magnitude star with a very faint companion. It may be found about ten degrees south-southeast of Rigel. Gamma Leporis is a double consisting of a yellow 4th magnitude and a red 6th magnitude star. In Chinese Horoscopes, 2011 is the year to follow the White Rabbit. The Year of the Rabbit started today and ends on 22 January 2012. Happy New Year!! !